U.S. Sending 600 More Troops To Iraq To Reclaim Mosul From Islamic State : The Two-Way Secretary of Defense Ash Carter says the increase, which brings the American total to about 5,000, anticipates a major operation to retake the Islamic State-held city of Mosul. U.S. Army Capt. Gerrard Spinney (right) speaks to his Iraqi army counterpart from the Ninawa Operations Command prior to a security meeting at Camp Swift, Iraq, earlier this month. U.S Secretary of Defense Ash Carter said the U.S. has agreed to send an additional 600 troops to Iraq, in anticipation of the major upcoming operation to retake the Islamic State-held city of Mosul. 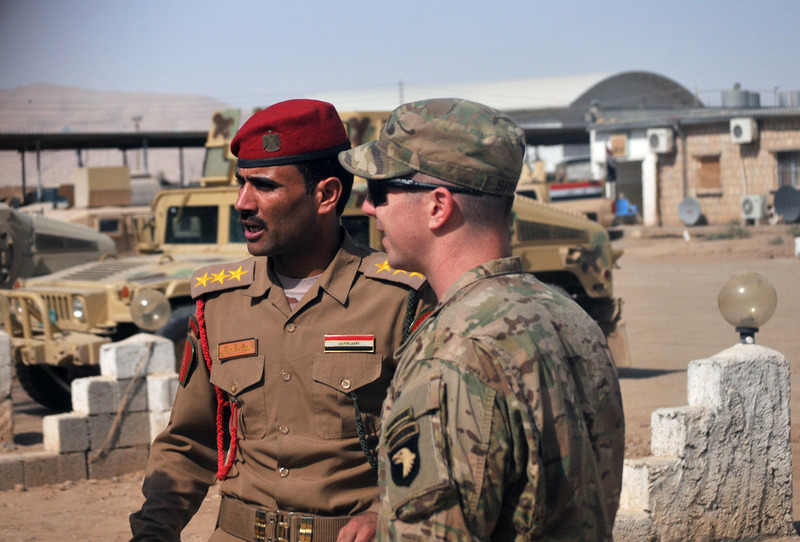 These additional troops "will increase the number of U.S. forces in Iraq to around 5,000," NPR's Tom Bowman told our Newscast unit. American troop levels in Iraq peaked at 170,000 in November 2007. Carter said the U.S. and Iraqi governments "have agreed that additional U.S. and coalition capabilities could help accelerate the campaign at this critical phase." As Tom reported, "the White House has insisted that the American troops are not in a combat role. But some of the U.S. troops in Iraq are special operators, who accompany Iraqi troops on combat missions." Two Americans have been killed in the country this year, Tom added. "The troops, in close coordination with the government of Iraq, will provide specific capabilities including logistics and maintenance support; train, advise and assist teams for Iraqi Security Forces and Kurdish Peshmerga for the upcoming Mosul operation; and expanded intelligence resources to help disrupt ISIL's terrorist network in Iraq and beyond." Carter said at a news conference that all U.S. troops in Iraq faced serious risks. "We're in a support role, but I need to make it clear once again: American forces combatting ISIL in Iraq are in harm's way," he said, according to The Associated Press. "No one should be in any doubt about that." White House spokesman Josh Earnest told reporters that President Obama approved the Pentagon's request for an increase in troop levels, adding that they "intensify a strategy that's already in place." The Islamic State group has been in control of the northern city of Mosul since 2014, and Tom reports that the operation is "expected to begin sometime in the fall."